Okay, I'll admit it! I'm a nervous wreck! Why, you ask? My very first historical romance is on sale today, and it's like being a brand new baby author all over again, even though this is my 70th published novel! You may not know this about me, but I LOVE LOVE LOVE historical romance. I was late to the historical party, reading the first one in 2007-2008, when one of my author friends published hers. I loved it SO MUCH that I started binging historical romances. My favorite author of all time, by far, is Lisa Kleypas, the queen of the historical romance. If you haven't read her Wallflowers, Hathaways and Bow Street Runners series, I highly recommend them—after you read my new book Duchess by Deception, of course! For many of you, a historical romance may be something ALL NEW, but I think you will find that it's still a Marie Force book, just set at an earlier time when things were SO interesting! Indoor plumbing and electricity were coming into vogue, the telephone was new and motor cars were starting to be incorporated into daily life. What an exciting time in the evolution of society, and I had a blast writing about my forward-looking duke and the many things he was involved in. Some of you have heard the story behind my foray into historical before, but for those who haven't... I started writing Duchess eight years ago and wrote half of it before realizing the time wasn't right to introduce historical romance into the picture when I was still working to launch my contemporary brand. Fast forward to 2017 when my Kensington Books editor Martin Biro heard I had a historical half written and asked to see it. He loved it and acquired Duchess as well as the second book in the Gilded Series. That meant I had to actually FINISH Duchess, which I did while on "vacation" last March, and TODAY it's finally on sale to readers. Phew! That gives Duchess the longest "incubation" period of any of my books. The second book, Deceived by Desire, is out in September and available now for preorder. That book is set in my hometown of Newport, RI, during the Gilded Age summers that put Newport on the social map. "Honestly, I wasn't sure what to expect. But true to form Marie snagged me right off the bat! I felt as though I was magically drawn back through time, landing in the midst of a Thomas Kincaid painting! Marie's word portrait was so vivid that I could hear music, feel the woosh of ball gowns, touch the soil, smell the flowers, see the horses and become completely enraptured by Derek and Catherine. (Sigh...) Their crazy and TOTALLY captivating love story elicited both laughter and tears from this reader. Villains and betrayals abound but love wins out!!! (Hooray for love!) This is a story you will want to savor and not rush so you can enjoy every delicious moment. (Still sighing...) Oh, that we could all have a Derek! Solidly 5 stars!!" Thank you so much for those kind words, Kris! 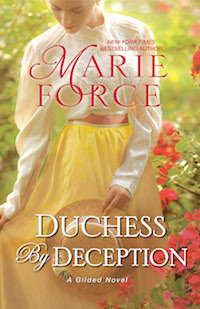 I was also THRILLED when Publisher's Weekly gave Duchess a coveted starred review, stating "Force has crafted a masterpiece." WOW! If you still aren't sure about whether Duchess is for you, check out the first two chapters here and read another EXCLUSIVE excerpt at Book+Main called, "Have you ever been kissed?" which takes place right when things start to get REALLY interesting between Derek and Catherine. 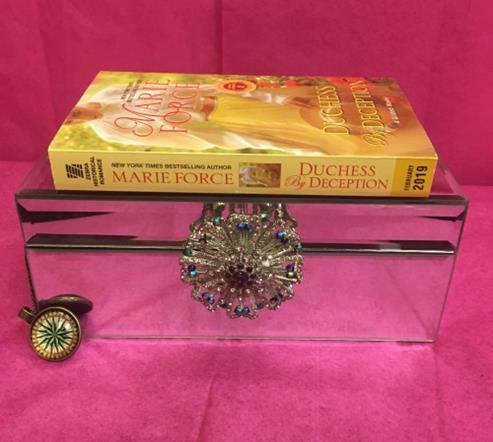 :-) Make sure you join the Gilded Series Reader Group for news about upcoming historical romances, and the Duchess by Deception Reader Group (after you're finished reading the book) to dish about Derek and Catherine's story with spoilers allowed! I'll also have some signed copies and other release week prizes up for grabs in the Gilded and Duchess groups this week. Read Duchess by Deception Today! Derek Eagan, the dashing Duke of Westwood, is well aware of his looming deadline. But weary of tiresome debutantes, he seeks a respite at his country home in Essex—and encounters a man digging on his property. Except he’s not a man. He’s a very lovely woman. Who suddenly faints at his feet. Catherine McCabe’s disdain for the aristocracy has already led her to flee an arranged marriage with a boorish Viscount. The last thing she wants is to be waylaid in a Duke’s home. Yet, she is compelled to stay by the handsome, thoughtful man who introduces himself as the Duke’s estate manager. Derek realizes two things immediately: he is captivated by her delicate beauty, and to figure out what she was up to, Catherine must not know he is the Duke. But as they fall passionately in love, Derek’s lie spins out of control. Will their bond survive his deception, not to mention the scorned Viscount’s pursuit? Most important, can Catherine fall in love all over again—this time with the Duke? Have you ordered a print copy? Request a book plate and we'll mail it to you. Read Duchess by Deception in GERMAN! More print and ebook links coming soon. Read During Release Week and Win! 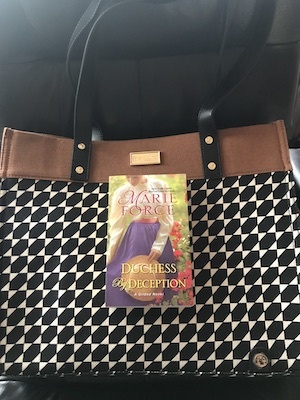 I'm giving away a Spartina purse, two signed copies of Duchess by Deception and other fun prizes worth more than $200! Two runners up will receive signed copies of Duchess and a $50 gift card to the book retailer of their choice. I'll reveal what else is in the bag during a Facebook Live chat on Tuesday, Jan. 29, at 7:30 pm EST at facebook.com/MarieForceAuthor. If you're looking to catch up or start a new series of mine, this is the ideal time! This BOGO offer is available in the US, UK, CA, AU and NZ through Kobo ONLY. You don't need a Kobo device to participate. You can download the FREE Kobo mobile app and ready anywhere, anytime. Sign up for a Kobo account here. Each new account will receive a $5 credit in addition to the BOGO deal. Download the Kobo app to your computer, smart phone or tablet. Follow me on BookBub and Book+Main. You are receiving this email because you have signed up for Marie's newsletter. You can unsubscribe at any time by using the link below.